And the first toile turned out pretty good if I say so myself. I have never really altered just part of a pattern to fit before so I am quite impressed with the fact that it actually worked. I needed to lose an inch on the bust only. For anyone that needs to know - to make a smaller bust adjustment when it's a raglan sleeve, curve off what you need to lose from the bust at the side front seam whilst taking the same measurement off the length on the front piece. The neck actually fits as snug as in the illustrations but I like it slouchy anyway so I probably won't bother putting on that button at the back. 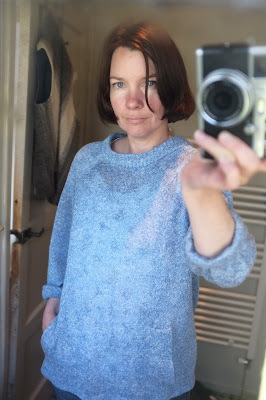 I used some fine knitted cotton jersey that was going for a song on ebay but which is almost certainly going to disintegrate into unravelled threads the first time I wash it. 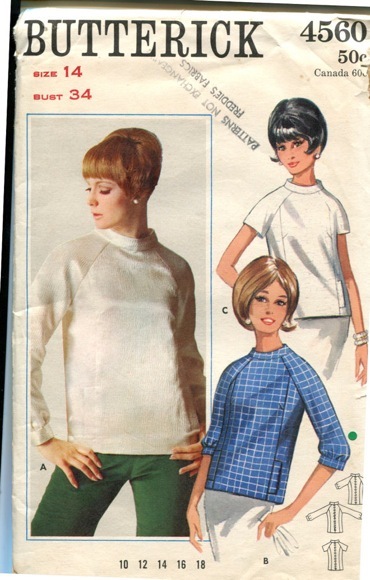 I need an overlocker. In my dreams I want to find some slubby sweatshirt jersey and then dye the sleeves a contrast colour using found plant dyes from the garden or the kitchen. It would also look rather lovely and neat in woven fabric - I may yet take it down longer into a dress.